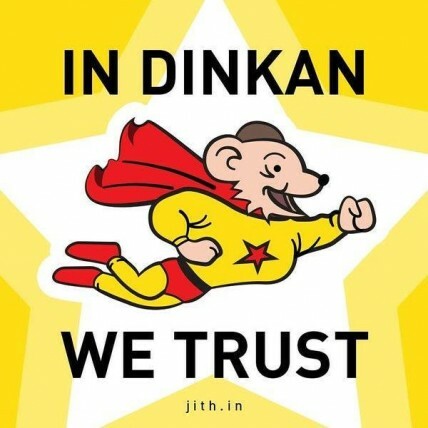 Early 1990’s kids from Kerala would cheerfully recollect ‘Dinkan’ as the merciful rodent superhero from the comic narrative ‘Dinkan’ that used to appear in popular Malayalam kids’ magazine ‘Balamangalam’. Dinkan — the superhero mouse — is now no longer a fictional character. The passage of time and the power cosmos seem to have finally brought the true divine identity of Dinkan to man’s attention. Dinkoists (advocates of Dinkoism), claim that it is the most ancient religion and Dinkan is the only true god. 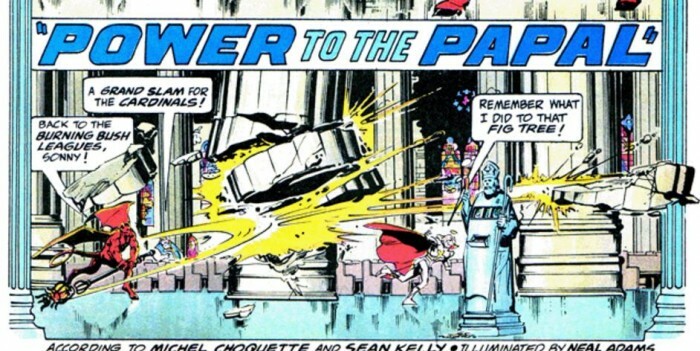 Followers of the god-turned-superhero rodent, have gone to the extent of claiming that all other religions took shapes from the offshoots of Dinkoism. This may sound funny, but Dinkoists are quite ‘sensitive’ about it and if you decide to laugh over it, you may land in trouble. They are quite ‘serious’ about their religion too. Noting Dinkan’s birthplace to be in Kerala, Dinkoists explain why Kerala is known as ‘God’s own country’. Dinkoist scriptures mention about the presence of a ‘flourishing’ Dinkan civilisation in Kerala as early as 18,000 years before the birth of Jesus. Also, the ancient Kerala folks enjoyed benefits of advanced technologies like aeronautics and electronics, say the scriptures. New age Dinkoists have accepted Balamangalam as their holy book. They claim that the religion is as old as 65 million years. New age Dinkoists developed some guts to woo more followers into the belief by pointing out some of the major social evils associated with popular religions on the planet. They are very outspoken against evil practices like child marriage, polygamy, patriarchy and oppression of women in general. Dinkoists also find it to be good with ‘God’ Dinkan than be on the sides of any those ‘egomaniac’ Gods, whom they call ‘narcissists’ as they are persistent in demanding constant attention from their folks. Why is there a surge in Dinkan’s acceptability ? ‘God’ Dinkan’s ideals were clearly shaped to counter the farcical and ridiculous practices imposed on people by religions in the present day. While the followers of Dinkoism may have all rights to exercise it, it also sheds light on preposterous religious practices and beliefs, which in turn would hopefully be eye openers to fundamentalists. For example, Malayalam movie actor Dileep recently outraged the rodent followers by deciding to act in a film, which takes the name of Dinkan rather disrespectfully. The protest staged by Dinkoists in Kerala was loud enough to make sense to even government officials. Kozhikode collector Prashant Nair, or better known as ‘collector bro’, in social media hailed the prospects of Dinkoism. It’s simple. Certain sections of people have started to develop a kind of exasperation with institutionalised system of religions and their subsets like caste and creed. The macabre state of affairs across the world largely caused due to propagandist and twisted religious beliefs would make alternatives like Dinkoism inevitable. Comical satire on religious practices and Gods like Dinkan is not a first of its kind. Son O’ God comics by American humour magazine National Lampoon, published between 1972 to 1976, became infamous in the Americas for its humorously ‘Jew-busting, Islam bashing, Catholic chastising’ story lines.